"Colegio Calasanz Bogotá" (CCB), founded on 21 March 1949 in Bogotá, was the first Piarist foundation in Colombia. The order was founded in the 17th century by St. Joseph Calasanz (1557-1648), who was declared "Universal Patron of all the Christian popular schools in the world" by Pope Pius XII in 1948. Calasanz founded in 1597 the first free school in Europe, and, in 1617 the "Pauline Congregation of Poor Cleric Regulars of the Mother of God of the Pious Schools" (named after Pope Paul V, who had approved it), which was elevated to a religious order in 1621 by Pope Gregory XV. The Piarists are known as "Escolapios" in some parts of South America, including Colombia. See: escolapios.org.co. The flag of CCB, according to a photo and the description available on the CCB website, is horizontally divided green-white-green with the Piarist emblem in the middle. Green represents the earth and our worldly history. White represents the celeste light and eternal life. The combination of the two colours represents the Piarist educationalist ideal, to reach God through the human life considered with radicality. The flag represents, therefore, the two Piarist educationalist principles, piety and literature, or, God's light and the human science's light. The Piarist emblem is made of a yellow sun with the anagram of the name of the Blessed Virgin in the middle and four Greek letters (mu, pi, thęta, gamma) standing for "Maria, Mother of God". The emblem means that the Blessed Virgin is the shield and protection of the students, whose way is enlightened by Jesus, light of the world. The flag appears to be used, at least in non institutional events, without the institute's emblem in the middle. "Escuela Normal Superior de Caldas" was founded on 26 January 2010 by Departmental Decree No. 86 in Manizales (Caldas Department), as "Escuela Normal Nacional de Señoritas". The flag of the institute, as shown and described on the institute's blog, is horizontally divided green-white. In the middle of the flag is placed the emblem of the institute. Green represent high aspirations and the ideal of Jesus. White represents a fair and pacific society and the purity of the heart. The emblem is based on the coat of arms of Manizales. The pink triangle symbolizes the commitment to education required from the teachers; the triangle is charged with the letters "ENSC". The three capitals of Greek style, on a golden (ochre yellow) background support the teaching activity. The coffee branches represent the region's economy and culture. The wheat seeds, as said in the anthem, are seeds of goodness and love. The triangle in the base of the shield is charged with a book showing artistic symbols, expressing the emphasis of the institute. Instituto Tecnológico Superior de Caldas (ITEC) is based in Manizales, Caldas Department. The flag of the institute, as used during the schools' parade held on 7 August 2000 in Manizales, is horizontally divided green-white. Instituto Universitario de Caldas (Manizales, Caldas). The University of Caldas, founded in Manizales on 24 May 1943, is made of the Faculties of Agronomic Sciences, Law and Social Sciences, Exact and Nature Sciences, Health Sciences, Engineering, and Arts and Humanities. 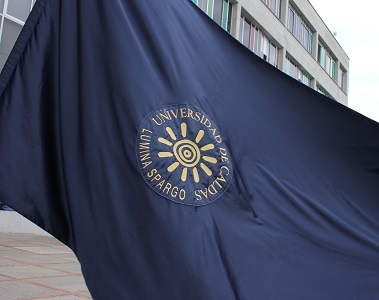 The flag of the university, as shown graphically and described on the university website, is blue with the emblem of the university in the middle. The institutional colours are associated with thought, as the quality and luminosity of gold and the deepness, seriousness and solemnity of blue. The contrast and the location of the emblem in the middle of the flag increases the meaning of the colours, offering a both classical and stunning picture. The emblem of the university is a sun with eleven rays, surrounded by the name of the university and its motto, "Lumina spargo" (also the name of the university review), all in yellow. Here's an actual picture of the flag from the University's website. Institución Educativa Técnica Camila Molano was established in Lorenzo Urueña borough, part of the municipality of Venadillo (Tolima Department), by Resolution No. 65 of 20 March 1963. Colegio de Bachillerato Comercial Camila Molina was established by Decree No. 733 of 19 May 1987. Institución Educativa Técnica Camila Molano was eventually established by Resolution No. 917 of 14 August 2002 as the merger of several smaller institutes. The institute is named for Camila Molano, from Espinal (Tolima Department), appointed director of the Venadillo girl's school in 1930. The flag of the institute is horizontally divided aquamarine blue-white with a gray triangle placed along the hoist. 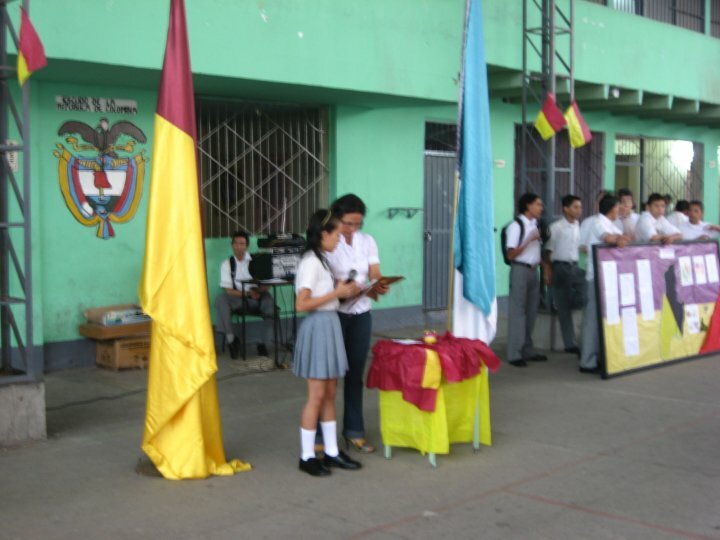 The flag was adopted in 1989, when the institute was established, separating from Colegio Francisco Hurtado. White is the colour of the sports uniform of the institute, and is a symbol of peace. Aquamarine blue is the colour of the second uniform, adopted when the institute was re-established in 1987. Gray is the colour of the first uniform used at the institute. Institución Educativa Camilo Torres was established in November 1968 in Granada (Meta Department) by Ordinance No. 21, as Colegio de Bachillerato para varones. Ordinance No. 13 of 27 November 1970 renamed the institute Colegio Departamental de Bachillerato Camilo Torres. Decree No. 425 of 25 June 2002 merged Colegio Departamental de Bachillerato Camilo Torres, Escuela Antonio Ricaurte, Escuela Alonso Montoya Pava and Unidad Educativa Club de Leones to form Institución Educativa Camilo Torres. The institute is named for the politician Camilo Torres Tenorio (1766-1816), President of the United Provinces of the New Granada (1815-1816), captured and executed by the Royalist troops. The flag of the institute is horizontally divided red-white-green (1:2:1) with the institute's emblem in the middle. The emblem of the institute features Camilo Torres, based on a painting shown in the Colombian National Museum (http://commons.wikimedia.org/wiki/File:Camilotorres.jpg). A similar portrait is used on the 50 peso banknote released in 1986 by the Bank of Colombia (http://yaymicro.com/stock-image/camilo-torres-tenorio/3503547). The institute's motto reads "We educate leaders". "Consta de tres superficies horizontales, el primer color que la compone es el color verde: Símbolo de esperanza, fe y naturaleza, es el reflejo de nuestros deseos y compromisos ante la comunidad. Además, representa nuevos contextos de aprendizaje. El color blanco, símbolo de paz y pureza, unidad y bondad, insignia de fraternidad para la Familia Modernista en el diario vivir, parte esencial en su fortalecimiento como plantel educativo. El azul, color que representa tranquilidad y armonía, simboliza para nosotros sabiduría y conocimiento, que se adquieren a través de los procesos educativos llevados a cabo por toda la comunidad educativa". Colegio Campestre El Himalaya was established in 1993 in the Manila borough, part of the municipality of Fusagasuga (Cundinamarca Department). The flag of the institute is horizontally divided green-blue. The flag of the institute, as shown graphically and on a photo on the website of the institute, is horizontally divided blue-green-red. Blue represents the immense sky and the unlimited horizon opened by the education provided by the institute. Green represents the high mountains surrounding the region, hope and optimism. Red represents the power and strength of the blood of Santander, flooding for love.